Toyota Rush SUV Become Official in Pakistan with Three Variants. Toyota Indus Motors Company has officially launched the all-new second-generation Toyota Rush SUV in Pakistan. Toyota has teased the customers with the mini Rush SUV two months ago and now launched it officially with its three variants. The Rush mini-SUV is used to be called the Daihatsu Terios back in 2010, but got renamed later by company. During the years, it has undertaken several design changes. The mini Rush SUV will compete with other similar mini-SUV’s such as Honda HR-V, Suzuki Vitara, and Honda BR-V. Toyota Rush 2018 is a 1500cc compact SUV, powered by the 1.5-litre petrol engine. The car is available with a 4-Speed Automatic and 5-Speed Manual transmissions and its engine make 104 PS of maximum power and 136Nm torque. It is designed with an excellent Submersion Height of 60cm that lets the car to glide freely on every terrain with absolute ease & comfort. There are three variants of Rush SUV including Rush S A/T, the Rush G A/T, and the Rush G M/T. on the whole the internal features are the same between the variants other than transmission options, some chrome ornaments, and other advanced tech. The Rush G M/T engine produces 136 nm torque and 104 bhp of horsepower. The seven seater SUV has a smart entry system and also compatible with i-Phone and Android. The SUV also has a tracking control system that makes it more secure. The interior of the SUV has high ground clearance, two-tone interior, push start, smart entry system, 7-seater fabric seats, 6 airbags, optitron meter, emergency signal system (ESS), MID display, climate control and rear AC vents, air mirroring, Bluetooth, voice recognition, back view mirror, speakers, various storage spaces, ABS brakes with VAC and HAC, traction control, parking sensors, and chrome plated front grille. It has built-in multimedia system, with 7-inch Capacitive Touch Screen, enables high resolution audio and video playback on multiple formats, with variety of inputs for an enriched multimedia experience. The new Toyota Rush demonstrates true beauty, luxury, style and is a perfect fit for an active & dynamic lifestyle. Its exterior has bidgestone tires, immobilizer with alarm, LED headlamps, ISOFIX seats, shark fin antenna, 45 liters fuel tank, chrome front grille, stylish alloy rims, fog lights with chrome bezel,rear combination lamps, roof rail, high mount stop lamp with shark fin antenna, rare window wiper, and much more. All variants of mini Rush SUV are available in six different colors including White, Black Mc, Silver M.M, Bronze M.M, Dark Red M.M and Deep Maroon Mc. How to Book Rush SUV in Pakistan? The booking starts form 11th September 2018 and the delivery time is 45 days. 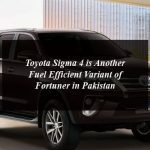 For more information you can visit the Toyota Pakistan official website.